Wow! Portal of Evil: Stolen Runes is another heavy-hitting hidden object game that was under $5! I picked this one up back in June during the Steam Summer Sale, and I was not the least bit disappointed. You’ve been called to a Monastery in Southern Italy by Archbishop Benedict to help find your estranged Grandpa, Abraham, who recently went missing. Abraham had been working with the church in Italy before he disappeared, and turns out was also a member of the secret society, the Order of Light, an important group tasked with keeping evil out of the world. But, he has been kidnapped, and evil is seeping in. You play as Vanessa, Abraham’s next of kin, and must find him before it’s too late. People, I have not been this excited about a casual game since Adam Wolfe. This is one game I actually looked forward to firing up after a long day at work; and I haven’t felt that way about a HOG in a long time. With over 6 hours of gameplay, Portal of Evil is quite a robust game with all the elements that I love – a compelling story, half-decent graphics, a variety of fun and interesting mini-games, and a pretty great map. About the map: you will need it. There are at least 5 different worlds with over 8 points of interest in each, but the map allows you to teleport to those places quickly. I can only imagine how frustrating it would be to have to backtrack to those different places in the game, places you would think you are done with but aren’t. This game is LOADED with places to go. There was no need to backtrack here – just follow the map! The hidden object scenes in Portal of Evil vary between finding objects by a list of words, and pairing one object with another. Apparently the developer, 8Floor, recognizes not everyone sits at a desk to play casual games: it played smoothly on my Windows 10 machine in Widescreen, and for once, each hidden object scene in Portal of Evil looked crystal clear on my TV, with no need to utilize the magnifier at all in gameplay. It’s important to emphasize I played the Collector’s Edition of Portal of Evil. The game came with an on-board strategy guide (instead of taking to the goggles to search for a half-complete one…). Gamers also get rewarded with a bonus story once they’ve completed the game; this extra gameplay fits seamlessly with the main story and adds another 30 minutes of gaming. About the only critique I’d give is to the cut scenes. You would think that with the attention they give to the gameplay graphics, the same attention would be paid to the cut scenes. People, they’re pretty cheesy. Why they gave the task to a first year college animation class, I have no idea* (*assumed by me, can’t be proven). And the voiceover work was pretty bad. Please, don’t base your decision to play this game on those terribly rendered cut scenes! Do yourself a favour and get Portal of Evil: Stolen Runes. It’s currently $5 on Steam and is well worth your time and money! I love a good deal (who doesn’t?). Try 0.59 cents for a hidden object game on Steam? Yep! 1 Moment of Time: Silentville was cheeeaaap. The accompanied video made the game look good, and it had mostly positive reviews, so I went for it! Sometimes buying bargain basement games is risky and does not end well (see my review for Dead Mountaineer’s Hotel). Games this cheap can be totally for shite, particularly the casual gaming set: developers that were plagued with production problems on the back end try their best to stuff the dirt under the rug so no one would notice, but the cracks show in the light in confusing plots, some cheap-looking graphics and bad voiceovers. Make no mistake…1 Moment of Time: Silentville has all these blunders. Just look at the opening slate! But, the amateur bits of this game are forgivable. Ultimately, this is a fun game with a lot going for it. The town of Silentville is a place where nothing ever happens. People go about their business quietly, leading ordinary lives. One evening, an odd storm rolls through and lightening strikes the town. One by one, residents disappear, and those that are left are living in some weird paradox where they try to leave but end up reappearing where they started. You are charged with finding the cause of this odd curse and stopping it. Stylistically, Silentville’s graphics appear a tad dated, but the game itself holds up, with puzzles and hidden object scenes that are varied and interesting. There are at least a dozen locations at one time to explore – with a decent map that allows you to warp to each location. You are also given a book that tracks what you have done and clues to direct you to what you have to do next. With this many locales, there is a fair bit of backtracking. About the only thing I didn’t enjoy here was that once I was done for good in an area, the game kept its access open, making me think there was more to do. Thank goodness for that warp map! Really though, I got to know Silentville‘s layout pretty well and did not often get all “turned around”. Where the cracks showed in Silentville fell on some of the hidden object scenes that would have the gamer search for an item that happened to be hidden behind the game’s static lower screen inventory banner. Not a big deal, but it seemed to be most HO scenes, and it did cost me a few achievements in the game having to use the Hint to find those items. A few minor bellyaches: anyone else think “1 Moment of Time” is a strange title to a game? I mean, writing this post, I had to go back and correct how I wrote the title a few times. Why a numeral 1 in the title; why not ONE? This grated on me a little in a wordsmithing way. But, I suppose it’s not as bad as the rampant and obvious spelling errors throughout the game, for which there is numeral 0 excuse! Overall, 1 Moment of Time: Silentville has staying power and variety. Most of all, it’s fun! And at 0.59 cents on Steam, it has been a pleasant surprise! This week marks the Steam Summer Sale, a time when gamers pick up some wicked deals on PC / Mac games. And as always, when these sales happen, gamers also notice a dip in their bank accounts. When I first started playing casual games – particularly hidden object – my go-to game stop was Big Fish Games (BFG). Of course, they have a curb on the market when it comes to the casual gaming genre. They are excellent at what they do, and have a similar way to access games as Steam, but the gaming sales on the site are only open to those who pay a monthly subscription fee to be a part of their Game Club; everyone else pays full price, which average from $10 to $20. Never one to be pigeon-holed, I always like to shop around to see what else is out there (okay, I am a cheap gamer!). This is always a risk, because BFG is a gaming distributor, but they are also a gaming developer, so many of their games are proprietary to their site, and not available on other gaming systems like Steam. BUT, sometimes you do find games sold on BFG available elsewhere. It can take a bit of work, but in your labour, there can be some fruit. And this is where you can win! Case in point: STEAM SALES!! In the past, I would basically ignore the Steam sales that my husband would always participate in, thinking there would never be anything I’d want to play (meanwhile, watching the bank account take a hit…). It wasn’t until the hubs encouraged me to start a Steam account so we could play Magika that I decided to take a look at what was out there for the Casual Gamer. Glad I did. 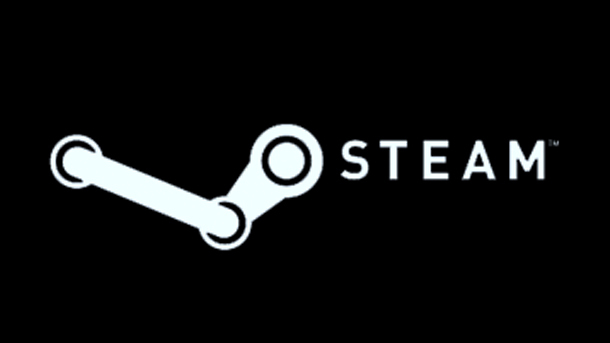 Where BFG’s gaming subject matter falls right in the casual gaming fold and only the casual gaming fold, Steam has something for EVERY gamer. 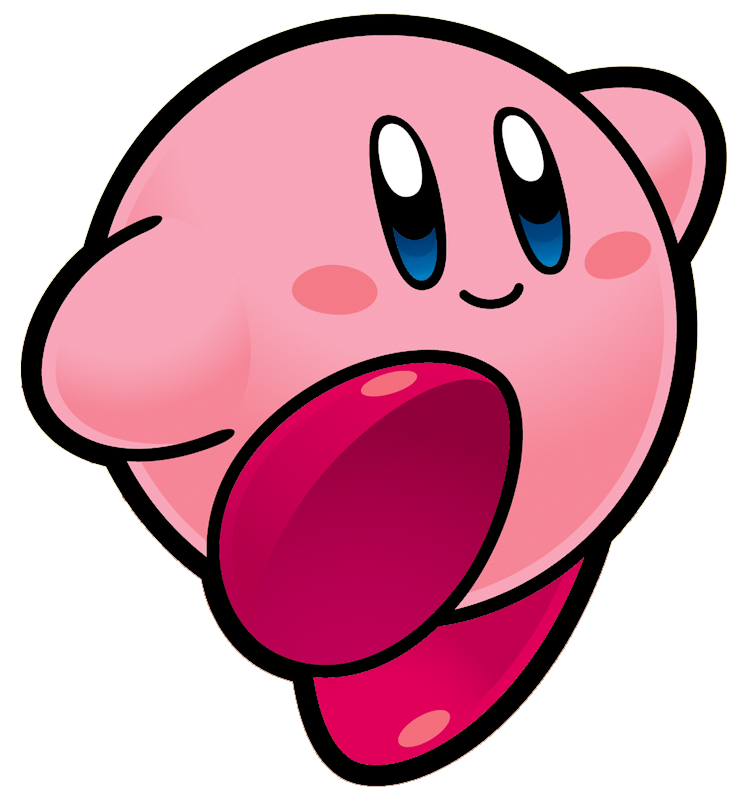 For example, it partners the RPG gamer with the adventure gamer seamlessly, and might even match the two to give some ideas for other games out there that fall in both genres, so a gamer looking to spread their casual wings into something a little more complex has some choices. I think this is great! 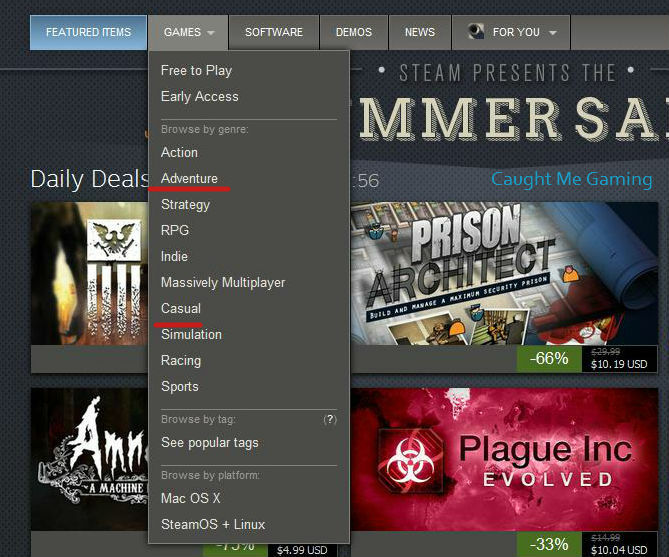 When you first search on Steam, the first place to look is under the Games drop-down tab. This lists all the game categories available. My go-to search is under Adventure and Casual categories. Unfortunately, though, if you are looking specifically for “Hidden Object” or say, “Survival Horror”, no category like that exists on the Games drop-down tab. But, there are a couple of other places to try. 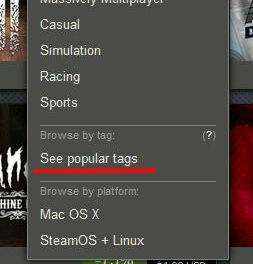 There is, of course, the Search box at the top that you can use, but another way to search on Steam that is in Beta right now is via tags. Steam is allowing users to tag games into specific categories that are atypical, and Hidden Object and Survival Horror are a couple of the categories. I was so happy to find this existed. It’s great, and new sets of games are being tagged daily. Last Summer, I played a game called Enigmatis: The Ghosts of Maple Creek. 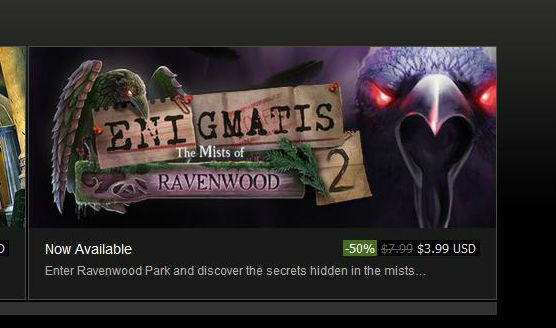 The sequel, Enigmatis: The Mists of Ravenwood is on sale for a deep discount on Steam. But wait! Big Fish Games is also selling this game. Big Fish Games is selling it for $10.21 ($7.14 if you are part of their Game Club). On Steam? $3.99, regular $7.99. Damn straight! It pays to shop around…and take advantage of Steam sales. So, how have I faired so far? There you go. 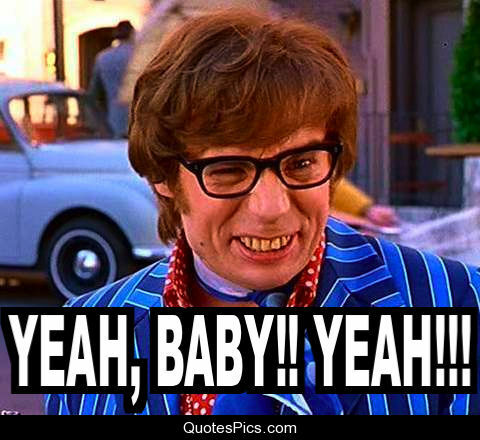 Now that I have imparted my gaming resource librarian skills, go forth and shop for deals! But most of all, HAPPY GAMING! !